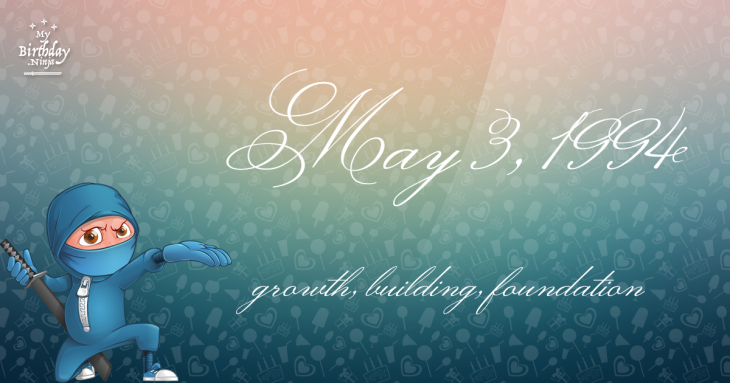 Here are some snazzy birthday facts about 3rd of May 1994 that no one tells you about. Don’t wait a minute longer and jump in using the content links below. Average read time of 10 minutes. Enjoy! What day was my birthday May 3, 1994? May 3, 1994 was a Tuesday and it was the 123rd day of the year 1994. It was the 18th Tuesday of that year. The next time you can reuse your old 1994 calendar will be in 2022. Both calendars will be exactly the same! This is assuming you are not interested in the dates for Easter and other irregular holidays that are based on a lunisolar calendar. There are 9 days left before your next birthday. You will be 25 years old when that day comes. There have been 9,122 days from the day you were born up to today. If you’ve been sleeping 8 hours daily since birth, then you have slept a total of 3,041 days or 8.32 years. You spent 33% of your life sleeping. Since night and day always follow each other, there were precisely 309 full moons after you were born up to this day. How many of them did you see? The next full moon that you can see will be on May 18 at 21:13:00 GMT – Saturday. Fun stat: Your first one billion seconds (1,000,000,000) will happen sometime on January 9, 2026. If a dog named Missy - a Papillon breed, was born on the same date as you then it will be 116 dog years old today. A dog’s first human year is equal to 15 dog years. Dogs age differently depending on breed and size. When you reach the age of 6 Missy will be 40 dog years old. From that point forward a small-sized dog like Missy will age 4 dog years for every human year. The largest of three earthquakes strikes the island of Rhodes and causes an estimated 30,000 casualties. A total solar eclipse was visible across northern Europe, and northern Asia, as predicted by Edmond Halley to within 4 minutes accuracy. The Canterbury and Whitstable Railway is opened. It’s the first steam hauled passenger railway to issue season tickets and include a tunnel. Charles XV of Sweden–Norway is crowned king of Sweden. World War II: Japanese naval troops invade Tulagi Island in the Solomon Islands during the first part of Operation Mo that results in the Battle of the Coral Sea between Japanese forces and forces from the United States and Australia. The U.S. Supreme Court rules in Shelley v. Kraemer that covenants prohibiting the sale of real estate to blacks and other minorities are legally unenforceable. The 108-story Sears Tower in Chicago is topped out at 1,451 feet as the world’s tallest building. The first unsolicited bulk commercial email (which would later become known as “spam”) is sent by a Digital Equipment Corporation marketing representative to every ARPANET address on the west coast of the United States. Curious about this Charming Gift Box? This is a party item you can activate and send to your friends when you play the free game Jump Birthday Party. It’s a fun and easy-to-play mobile game for all ages. Get free 1,000 gold coins when you download today! What does my birthday May 3, 1994 mean? Your birthday numbers 5, 3, and 1994 reveal that your Life Path number is 4. It represents growth, building and foundation. You are practical, down to earth with strong ideas about right and wrong. The following celebrities also have the same life path number: Oprah Winfrey, Will Conlon, Matt McGorry, Keith Chegwin, LaTavia Roberson, Juelz Santana, Mandy Rice-Davies, John Patrick Amedori, Cliff Williams, Kardinal Offishall. What is the birthday horoscope for May 3, 1994? The Western zodiac or sun sign of a person born on May 3 is Taurus ♉ (The Bull) – a fixed sign with Earth as Western element. The ruling planet is Venus – the planet of love and beauty. According to the ancient art of Chinese astrology (or Eastern zodiac), Dog is the mythical animal and Wood is the Eastern element of a person born on May 3, 1994. Fun fact: The birth flower for 3rd May 1994 is Lily of the Valley for purity. What is the Love Match for May 3, 1994? When it comes to love and relationship, you are most compatible with a person born on March 15, 1996. You have a Love Match compatibility score of +144. Imagine being in love with your soul mate. On the negative side, you are most incompatible with a person born on October 23, 1978. Your incompatibility score is -138. You’ll be like a cat and a dog on a love-hate relationship. Arf-arf, I want to bite you. Meow-meow, stay away from me! The number-one hit song in the U.S. at the day of your birth was The Sign by Ace of Base as compiled by Billboard Hot 100 (May 7, 1994). Ask your parents if they know this popular song. I do not know how you feel about this, but you were a male ♂ in your last earthly incarnation. You were born somewhere around the territory of Ukraine approximately on 1375. Your profession was preacher, publisher, scribbler of ancient inscriptions. How many babies were born on May 3, 1994? Base on the data published by the United Nations Population Division, an estimated 133,066,731 babies were born throughout the world in the year 1994. The estimated number of babies born on 3rd May 1994 is 364,566. That’s equivalent to 253 babies every minute. Try to imagine if all of them are crying at the same time. What is the popular baby name on 3 May 1994? Here’s a quick list of all the fun birthday facts about May 3, 1994. Celebrities, famous birthdays, historical events, and past life were excluded. 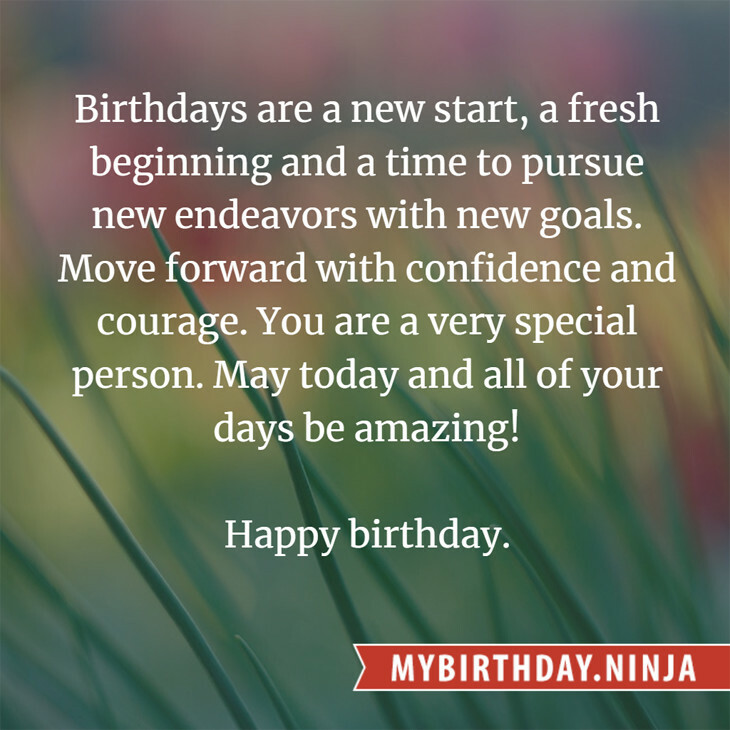 Try another birth date of someone you know or try the birthday of these celebrities: January 16, 1957 – Ricardo Darín, Argentinian actor, director, and screenwriter; April 12, 1986 – Athena Lundberg, American model; September 29, 1948 – Yelena Drapeko, Kazakhstani-Russian actress.